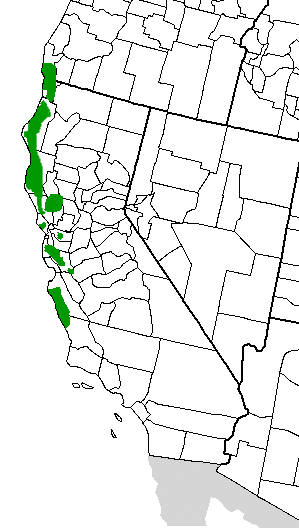 Most people do not realize that the coastal redwood trees lives on a very narrow strip of land that is approximately less than 500 miles long, with the most southerly grove is in Monterey county, California and with the most northerly groves are in extreme southwestern Oregon, with the width of land is anywhere from five miles up to about forty-five miles. The elevation range is mostly from 100 feet above sea level to as high as 2,500 feet and a few have been found at the 3,000 foot elevation. The tallest and oldest trees are found in deep valleys and gullies, where year round streams can flow, and fog drip is regular. Redwoods are so immense that they live in three climatic zones at once. The base of the redwood tree is in one set of climatic conditions, with the stem in another, and the crown of the redwood tree in yet another. On the forest floor, it is a semi-shaded moist environment. But if your were on the top canopy of the redwood tree you may find it dry and possibly windy. On the forest floor of the redwood tree, you will see two types of needles. The needles on most of the tree branches are broad and flat so that they can catch the available sunlight. But the needles near the top of the redwood tree however, have tight scale like spikes which reduce evaporative surfaces for the drier conditions found there. The redwood tree needs great amounts of moisture. With an average of 65 inches a year and the most important summer fog which is caught by the tree leaves and drips down of the forest floor. The redwood trees help create their own micro-climate through the transportation of moisture from the leaves to the atmosphere. A very large redwood tree can release up to an amazing five hundred gallons of water a day into the air. The thick, tannin-rich bark, combined with foliage starting high above the ground provides good protection from both fire and insect damage, contributing to the coast redwoods longevity, so this species has many fire resistant characteristics. In addition, fires appear to actually benefit the redwood tree by causing substantial mortality in competing species while having minor effects on the redwood tree. One recent study, compares post wildfire survival and regeneration of redwood and associated species, concluded fires of all severity increase the abundance of redwood trees and higher severity fires provide the best benefit. 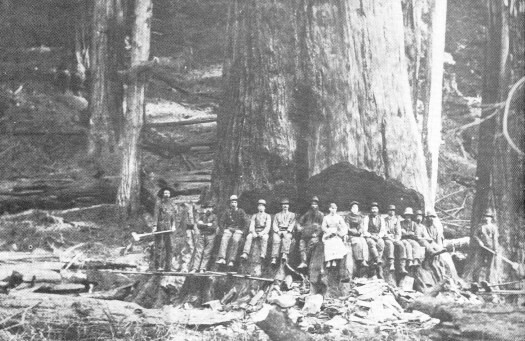 Back in the 1850′s, the coastal redwoods occupied 1.92 million acres. Today is only about 2% of that or about 80,000 acres. Redwood trees are remarkably fire-tolerant and long-lived with five hundred years is an average life span, but some are more than two thousand years old. The heart of the redwood, also known as heartwood has grown-in resistance to decay and insects that is present throughout the lumber, not just on the surface. The wood exposed through sawing, boring or nailing is as decay-resistant as the surface. In old growth redwoods the first limbs are sometimes more than one hundred feet up, so there are no knots, even in long boards. The grain is so straight you can lay a ruler on it. The coastal redwood tree produces both sexually by seed and asexually by sprouting of buds, layering or lignotubers. Seed production begins at ten to fifteen years of age. The winged seeds are small and light and the wings are not effective for wide dispersal, and are dispersed by wind on an average two to four hundred feet from the original tree. The growth of seedlings is very fast, with young trees known to reach about sixty-five feet tall in about twenty years. Coast redwoods can also reproduce asexually by sprouting from the root crown, stump or even fallen branches if a tree falls over, and generate a row of new trees along the trunk. Sprouts originate from dormant or adventitious buds at or under the surface of the bark. The dormant sprouts are stimulated when the main adult stem gets damaged or starts to die. Many sprouts spontaneously erupt and develop around the circumference of the tree trunk. Within a short period after sprouting, each sprout will develop its own root system, with the dominant sprouts forming a ring of trees around the root crown or stump. This ring of trees is called a “fairy ring”. Sprouts can achieve heights of eight feet in a single growing season. Redwoods may also reproduce using burls. A burl is a woody lignotuber that commonly appears on a redwood tree below the soil line. Burls are capable of sprouting into new trees when detached from the parent tree, though exactly how this happens is yet to be studied. So with your visit here on the beautiful Mendocino coast, stop by the Guest House Museum on Main Street, Fort Bragg, California and check out this redwood round on exhibit on the front lawn of the museum. This redwood tree started as a seedling at about 190 A.D. By the time the Roman Empire ended the redwood tree was about 205 years old. It was already over 1,300 years old when Columbus landed in America, and it was over 1,750 years old when it was harvested and sent to the Union Lumber Company in Fort Bragg, California. 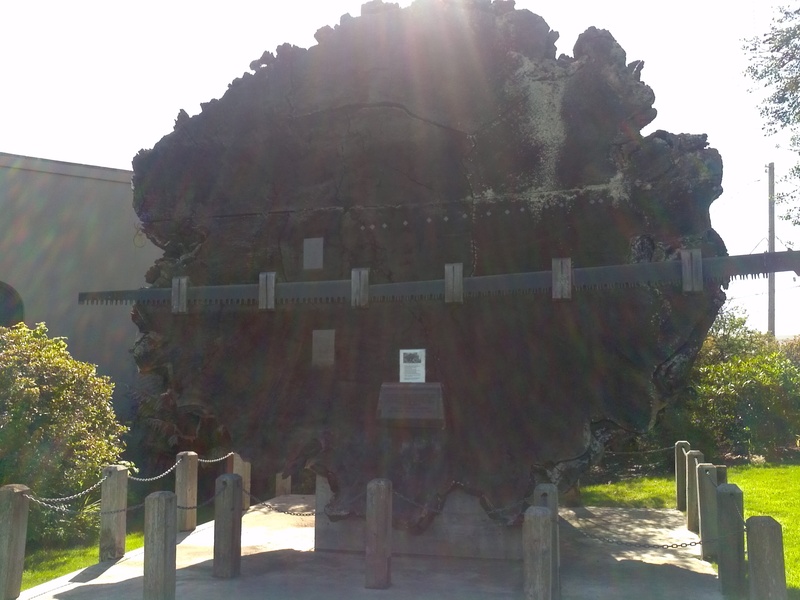 This entry was posted in Mendocino Interest and tagged asexually, burl, burls, climate conditions, coast redwoods, fire resistant characteristics, forest fire, forest fires, forest floor, fort bragg california, giant virgin redwoods, guest house museum, heartwood, lignotuber, mendocino coast, monteey county, needles, post wildfire survival, redwood, redwood grove, redwood round, redwood tree, regeneration of redwood, reproduce, seedling, southwestern oregon, sprouting, tallest and oldest trees, tanin rich bark, two thousand years old, union lumber company, virgin redwood, virgin redwoods, wildfire.